‘Tenugui’ is a type of traditional Japanese hand towel made from bleached thin cotton cloth with the size of about 35cm wide x 90cm long. There are so many varieties in term of pattern, color and also usage such as for wiping, covering, wrapping, display and etc. The word ‘Tenugui’ was found as ‘Tanogohi’ in the documents written during Heian period (AD 794-1192). ‘Ta’ means hands and ‘nogohi’ means wipe. It was used for wiping body, covering, and wrapping purposes. Though Tenugui had been used since long time ago in Japan, it became more popular in the beginning of Edo period(1592-1868) and mass manufacturing started at the same time. This was due to the domestic production of raw cotton and tenugui was widely used in daily life such as a bath towel at the public bath ‘Sento’. In recent years, Tenugui is popularized as an interior item or a piece of fashion accessory. The dyeing technique called (*)’Naga-ita chugata zome’ has been improved at the beginning of Meiji period, and the ‘Chusen’ technique has been used for mass production. Those ‘yukata’ (summer kimono) and/or tenugui which use ‘chusen’ dyeing technique are being known as ‘Tokyo honzome’, especially in Kanto area. The ‘Chusen’ can create varieties of patterns, motifs by using different techniques. The signature of Chusen is the ability to produce patterns/motifs on both sides, as the dye infiltrates the fabric. Especially, the technique called ‘Sashi-wake zome’, which can dye fabric in many colors by using only a single piece of stencil, is known as a very unique dyeing technique in the world. 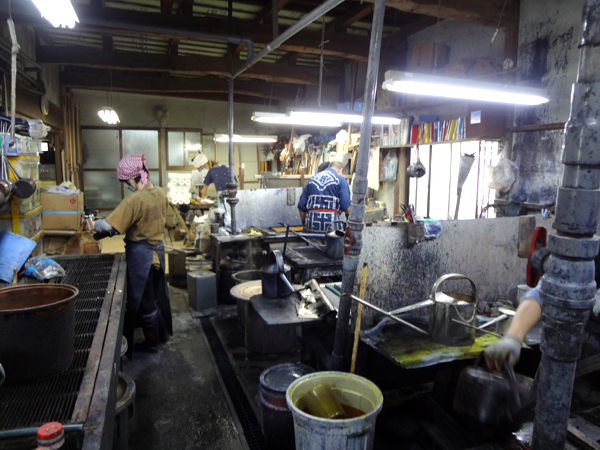 Besides that, the technique called ‘Bokashi zome’ can produce gradation effect at the same time through high standard of craftsmanship. 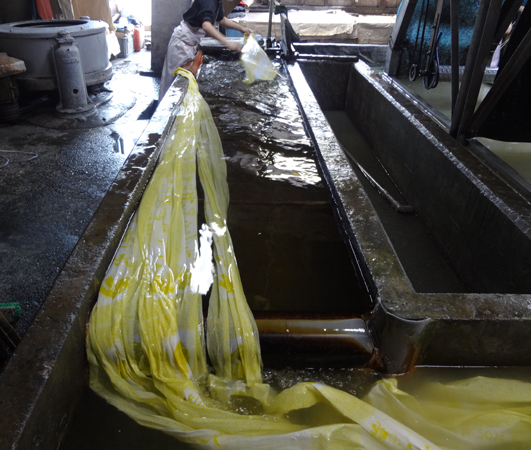 Chusen-dyeing process involves application of traditional Japanese techniques and method.